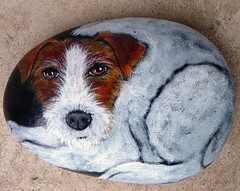 This piece I just completed as a donation for a jack russell terrier rescue fundraiser, Carolinas Jack Russell Terrier Club, in South Carolina. I have a JRT mix, my dog Gumbo, and I love those little terriers. Click here to find out more about the JRT rescue and see their dogs for adoption. This is the finished piece for my second place winner in my Valentine’s Day raffle that benefited a local feline rescue. 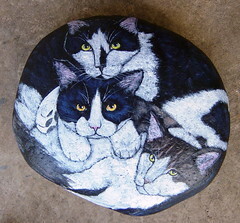 This second place winner won a rock portrait and I painted 3 of her cats on this large rock! She calls them her Seinfeld cats, and this is Kramer, Jerry and George! Such cute cats and such fun subjects! Enjoy them Minnie!! I have a beautiful black cat to paint in oils on canvas for the first place winner, that will be arriving here soon, so stay tuned! 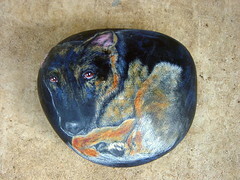 was commissioned to paint a lovely german shepherd, and while I was working on this rock portrait, Rusty suddenly and tragically passed away. So bittersweet. I am so hoping his owner finds comfort in this portrait. Rusty was such a beautiful dog. Yes, I’m posting about this again because, well, it’s important! Time is running out to enter my charity raffle to benefit the cats of Forgotten Felines and get your chance to win a custom pet portrait! It’s been tough times for everyone these days, and animal rescues especially have been hard hit. These rescue folk work so hard for the cats in their care, and remember that every little bit helps. You only have until noon on Valentine’s Day to enter, that is when one of my cats will be picking the winner!